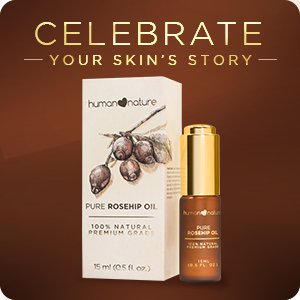 Step into the light with a new chapter of healing with Human Nature's 100% natural, pure, premium grade Rosehip Oil. Cold-processed from top-quality rosehip fruit hand-picked and ripened to perfection, each potent drop is rich in vitamins and essential fatty acids that help improve skin elasticity, assist in skin regeneration, and reduce uneven pigmentation. Bridge skin recovery to radiant rebirth and let clearer, younger-looking skin spring forth.